MK Eldad (NU): turpitude will forever stick to Olmert. MK Shai (Kadima): Leave Olmert alone. Initial reactions from nationalist politicians to the relatively light sentence in Ehud Olmert's trial are critical of the court. MK Aryeh Eldad (National Union) proclaimed: "The ridiculous punishment meted on a minister who became prime minister, who breached the public's trust, will not erase the simple fact that the turpitude will stick to Olmert forever and ever." MK Tzipi Hotovely (Likud) blasted the court more directly. "The judicial system proved itself toothless today," she said. "The District Court judges have paved the way for a criminal convicted of governmental corruption to 'guard the cream'." She was referring to the popular expression "letting the cat guard the cream," and to the fact that the light sentences make it legally possible for Olmert to go back into politics and run for Prime Minister. 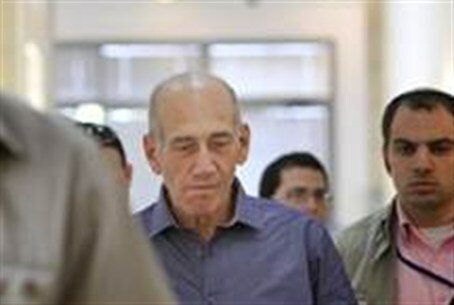 MK Nachman Shai, of Olmert's Kadima party, said Monday: "This story has reached its absolute and final end today. The State Attorney's Office needs to wake up to reality. There is no justification for an appeal and everyone should just leave Ehud Olmert alone. Anyone who is concerned over the rule of law in Israel should respect this." MK Michael Ben-Ari (NU) said: "The ridiculous sentence meted out to Ehud Olmert is a failure of the court system in the 'Bouzaglo test'. Any ordinary citizen would have been sent to jail if he was convicted of such crimes." The "Bouzaglo test" is a phrase that refers to the need for judges to mete out similar sentences to rich and powerful people as they do to poor people with low social status.